Dow Jones jumps +178 points to end above 12k. Despite a 0.9% climb in oil prices and a weak Feb existing home sales, the Dow rallied (+1.5% to 12037) for a 3rd day, as fears about Japan's damaged nuclear plants eased and investors cheered a huge merger in the Telco industry. Corporate mergers headlined by AT&T Inc. enthused investors who had been distracted for more than week by swift-moving events in Japan and North Africa. AT&T said Sunday that it planned to buy T-Mobile USA for US$39bn in a move that would make AT&T the nation’s biggest wireless player. 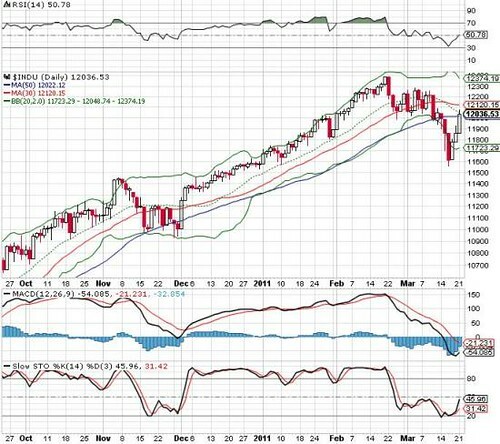 Daily Dow Jones Poised To Retest The Upper Bollinger Band Amid Bullish Technical Indicators.